In twelve years I have seen the farmer I live with change and grow to become something more than he was. Just as his farming operation has. built a home where there was a soybean field before. he has done much more than I have listed here. 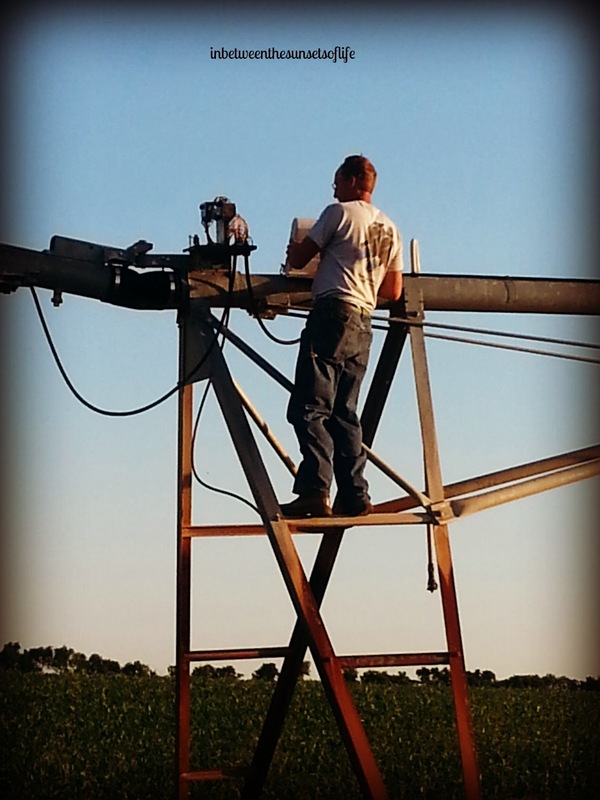 What I wanted to really get across is that farmers work hard, so do other occupations. Just as all individuals have the opportunity to grow, so does the farmer. 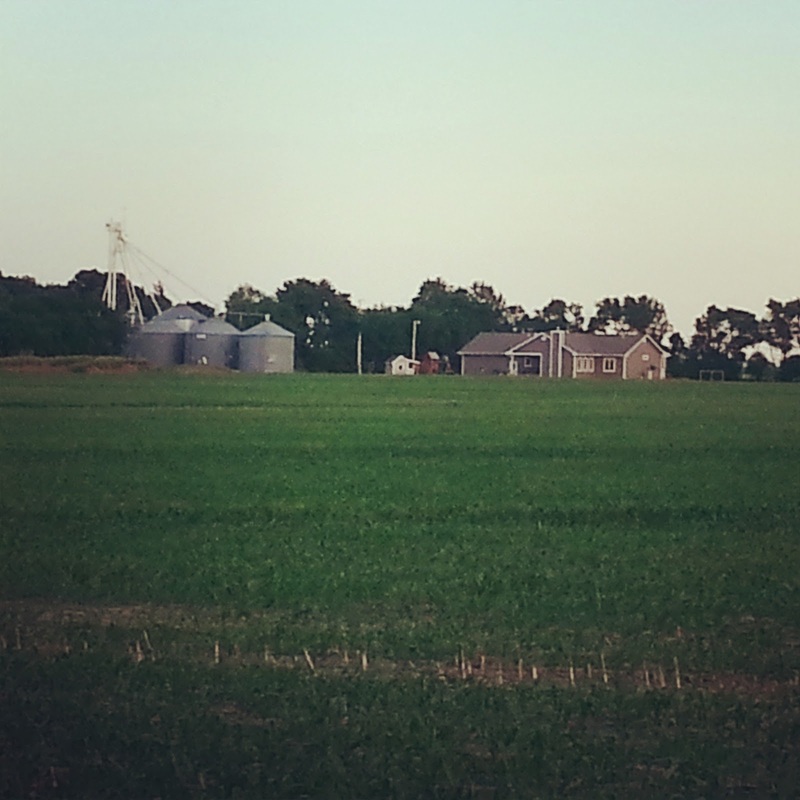 I think the farming community is lucky because they get to do it in the wide open spaces, in the beautiful pastures and fields, the sun shining on their face, and the knowledge that they make a difference every day. Whether their year is a super success or a "go to the bank and borrow" type of year, they can still stand proud. They can still get up each day and continue to make a difference with what they have been given. They are needed in the world we live. Continuing a Legacy - The Time to Start is Now! 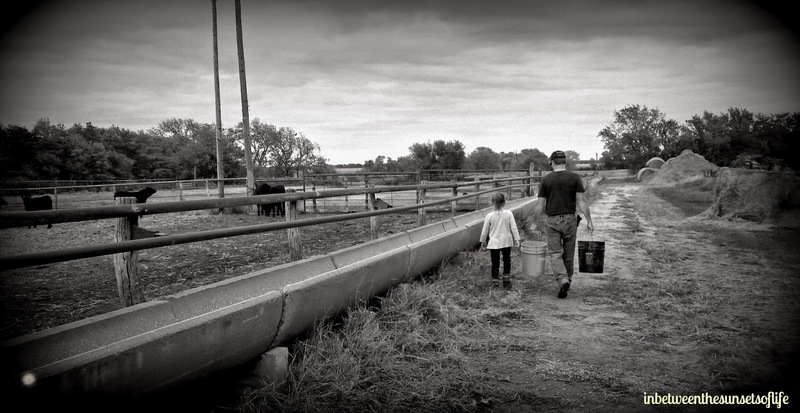 Whether you have a family owned farm or a family business, preparing for the next generation is a crucial part of continuing the legacy. Building that legacy can be a lifetime of achievement or start many generations back in your family. 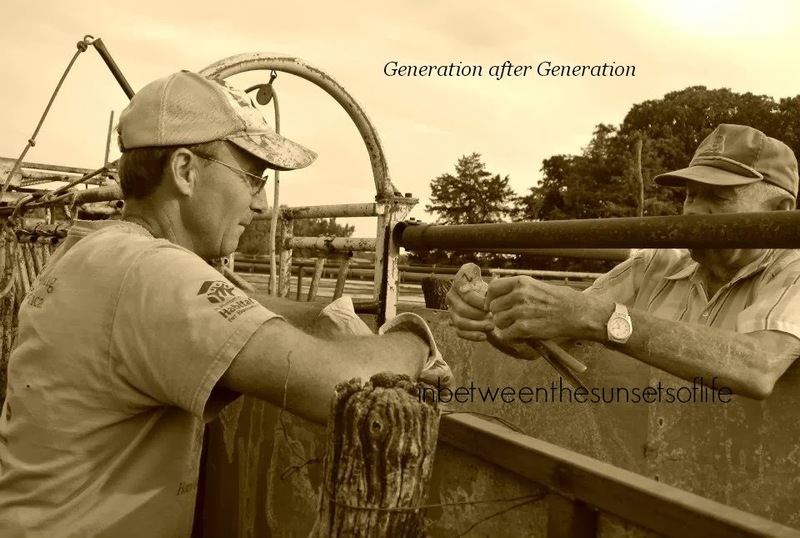 For us this comes to mind as time seems to be fluttering by here on the farm and before we know it that young daughter we now have will be heading off to college or choosing to work at the farm. 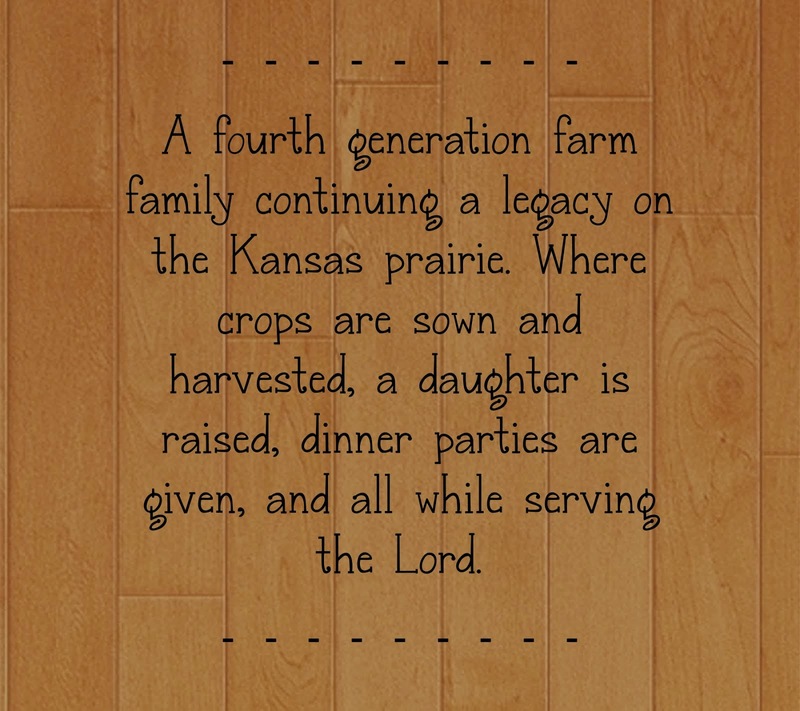 So how can we extend the legacy that has been in the family farm for four generations we ask ourselves. Milton and I attended a free informative meeting this week to bring this to the forefront of our thinking. We have had discussions but never really in detail. 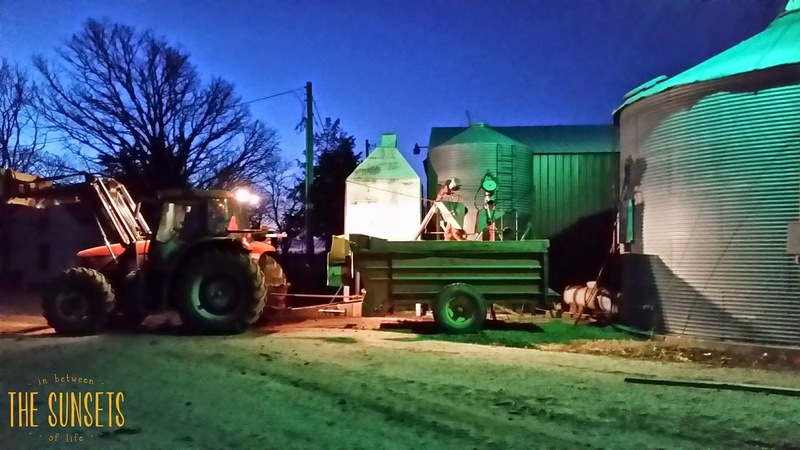 Although we are what most might call young in the farming community (44 and 48) it is now when we need to begin preparing for the future of the farm. At this meeting various things were mentioned. Anything from inheritance taxes to splitting up the farm equally amongst children that are non-farm workers and those that do farm, and how you have options in making the right choice that it is done well. 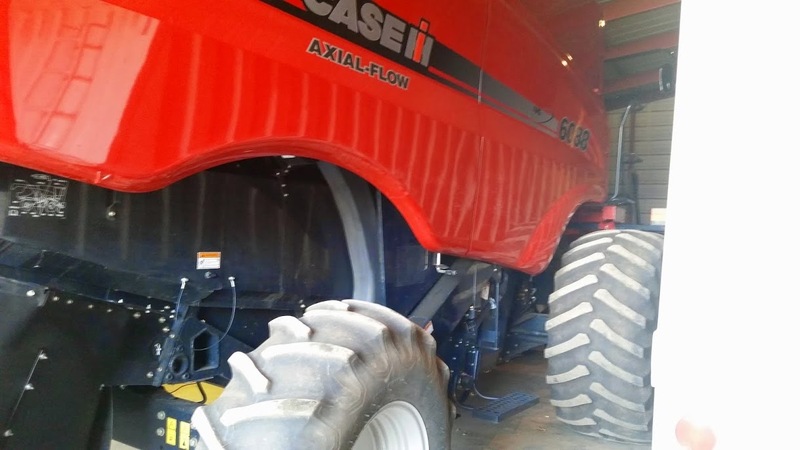 Each farm or business is different and each one is a case by case basis. 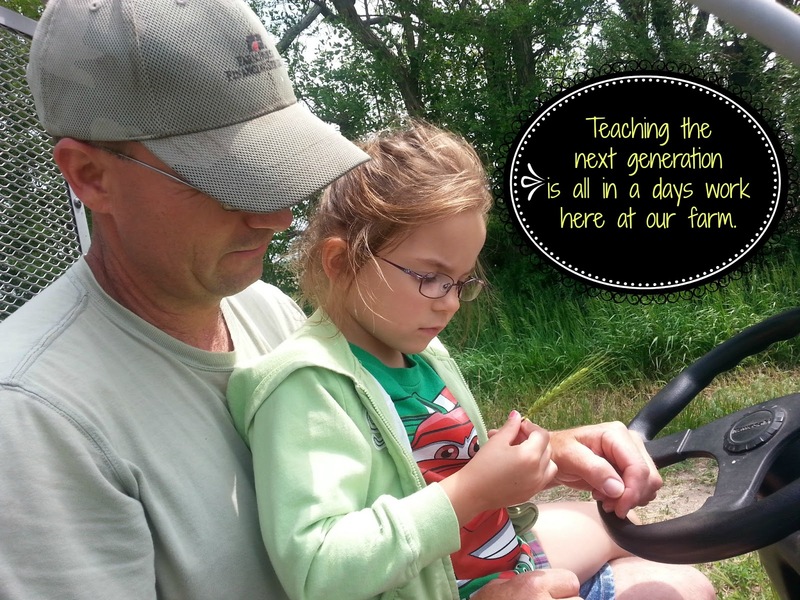 The world is ever changing and just as we do not farm like we did 50 years ago, one can not ignore or not plan to help the generations ahead when speaking of the future farm. If this legacy is to continue, it just has to be planned well. 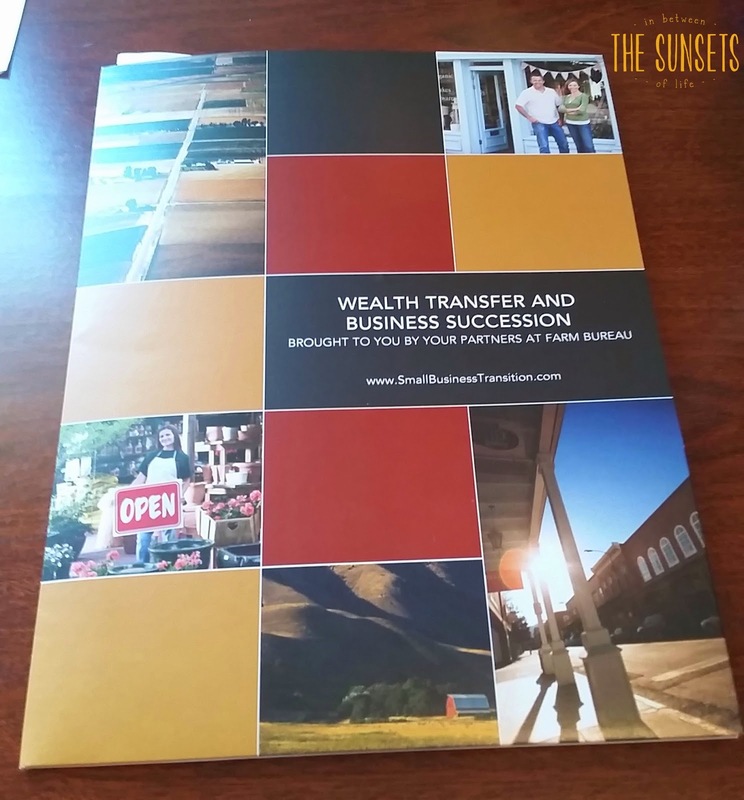 There a many options available to help farmers and business owners make the transition easier on the coming generations. It will also provide peace of mind to the current generation, knowing that no one is put in a hardship or have family squabbles or lose what they built up in their lifetime. Since recently becoming more active in our farming operation by doing the farm books I see the amount of money that is needed to run it. I can see how much equipment costs, repairs cost, land rent, fertilizer and chemical costs are. All with land not becoming available or if so one can only buy if they are more than "average" farmer. We are an average farm size I believe and average suits us. But being average also means that planning is important. That helping the next generation not feel overwhelmed or lose what they have spent their life working for, means we need to plan now. I'm sure it is difficult for some to begin making plans for the future. There are those that do not like to pre-plan their own funeral but in doing so it helps the ones they leave behind. Then we have the folks that prepare and plan exactly how things should be. Just as there are different types of businesses and farms, there are several opinions and choices. If you have planned, be sure to review the plan periodically. My point of this post today is to begin the discussion in your family farm or business about the future. Even if it seems a long way off it is a positive move to plan. Using the resources available through your accountant, attorney, financial planner, and insurance agent will be a good start. For example if you are a Farm Bureau member, there is a free benefit where they will collect your data and show you where you stand. It's an option, just one, but it's still available. * All opinions are my own and not Farm Bureau Financial Services. 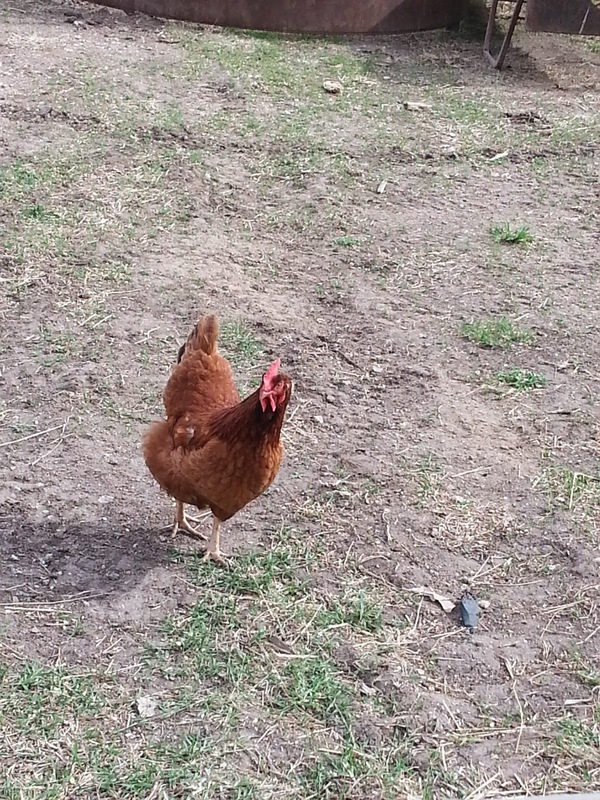 On an early morning last week I traveled out to my yard to get some exercise before the craziness of the day began. Milton was already at the farm yard preparing to feed the calves. I made my way over there to take a few photos of him working. 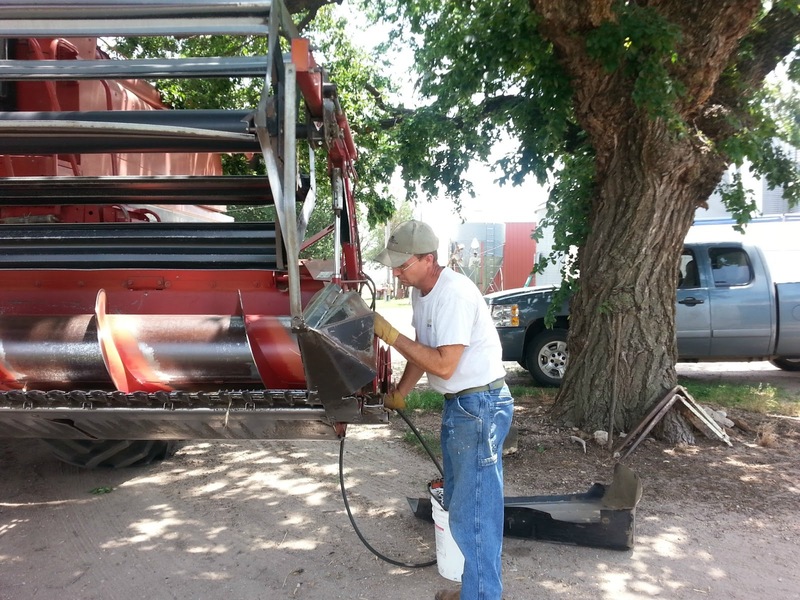 Here he is loading the feed into the feed wagon. As you can see it is still dark outside and it was chilly this January morning. He is filling the feed bunk with the feed. It makes my heart feel good to see him working for our family and others. To know that he loves what he does make it all the more better! As I made my way to the end of our driveway this was my view. I will end the post with one of the evening moments in our home. 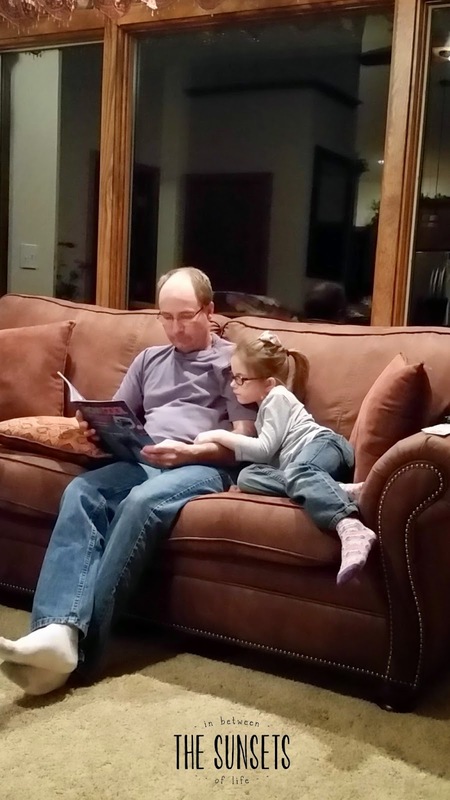 Dad reading to his little girl! If you haven't been out to the blog lately you will notice it has a different look to it. I decided after a couple years it might be time to have a professional create a custom look for our blog. My friend Laurie at Country Linked recommended Erin to help us create our new blog look. If you take a look at Erin's website you will see her talents are many. Be sure and go check he out! Her website is www.erinehnle.com. 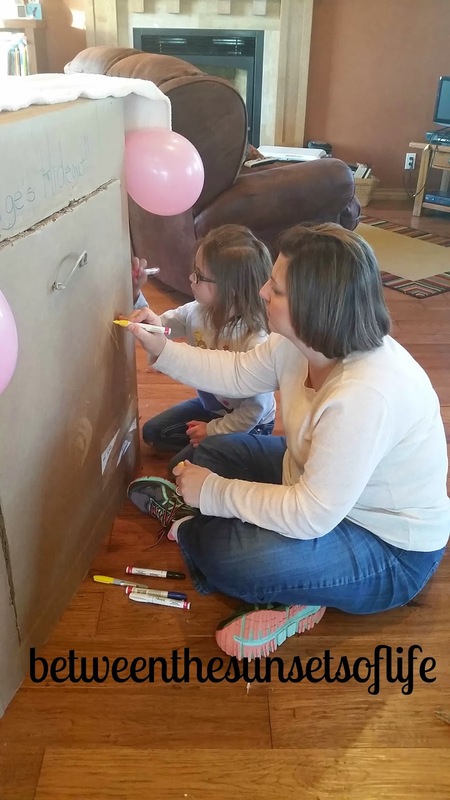 After we saw what Erin did for Laurie on her blog, we had no hesitations about using her! 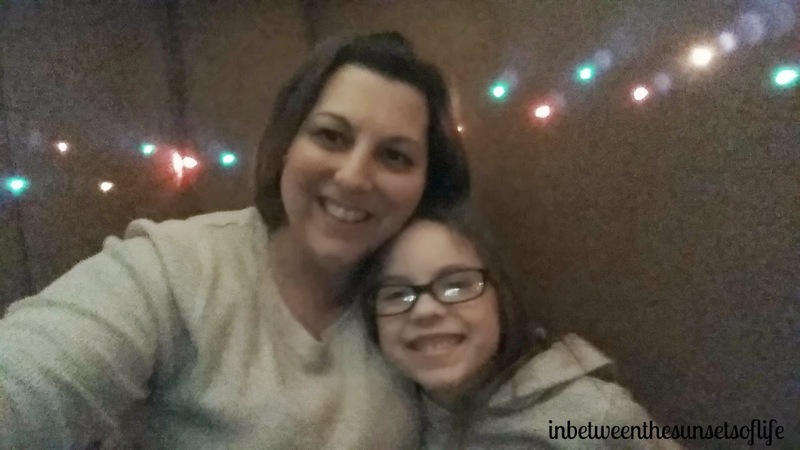 Be sure to check out Laurie's blog too if you haven't yet! Super cute kids and pigs and more! When Erin asked us what we wanted and offered ideas, I could only come back with the fact that our (entertaining) kitchen is a good representation of us. When I look at the kitchen that Milton built, it shows who we are. Simple, classic, yet farm. We feel Erin did quite well bringing that to our blog! What do you all think? Our lives are ever changing and 2015 will be no different I am sure. We are in a really good place right now in our lives and we are thankful for all that we have and that we are sustained another day by our Lord. On the blog side of things we plan to do a couple series this year and keep with our Adoption series in November. If you know of anyone interested in helping us this year be sure to share our email address. 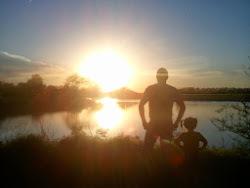 betweenthesunsets@gmail.com, we would really like to continue this series from year to year! 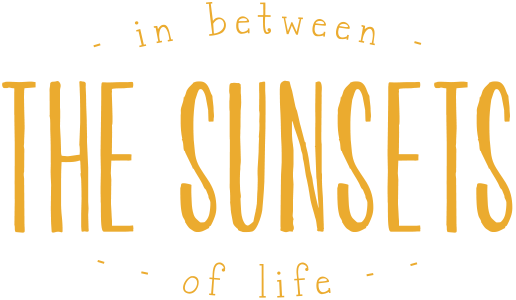 Although my other blog is written daily, it has brought me to a place of expression that I feel doesn't quite fit here at the Sunsets. If you care to join me there I'd love to have you. Pushing Forward with Grace I'm doing a great series of sorts over there! #pfwg44thbirthday Join me in donating blood in 2015 or sending handwritten letters (44). Before we know it spring will be here and the livestock will be sold and the corn will be getting planted! Winter is a time for rest for us, yet we always find things on the farm to catch up on! I received a great gift from my family for Christmas, 52 weeks of cards. I open one every Friday and last week gave me a challenge. My middle daughter channels her inner child a lot of days, so you can imagine what her card was about. I am more on the serious side, but as I grow older I am getting a little less serious with life! I accepted the challenge! Today was the day! 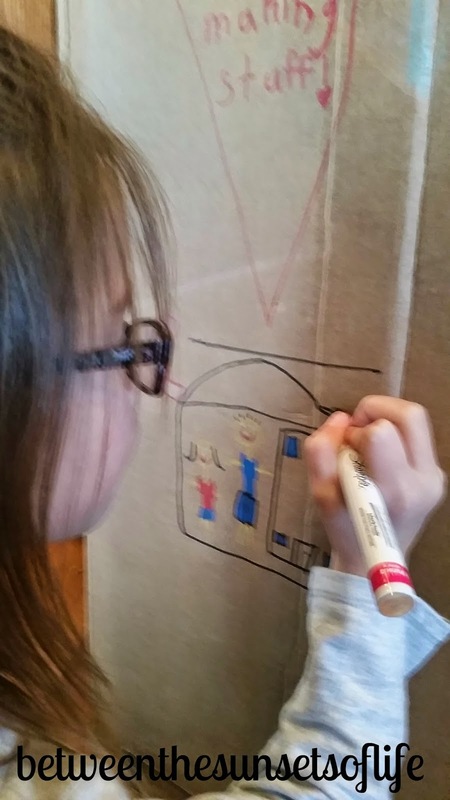 I am not sure if I have mentioned my youngest daughter's passion for all things cardboard. 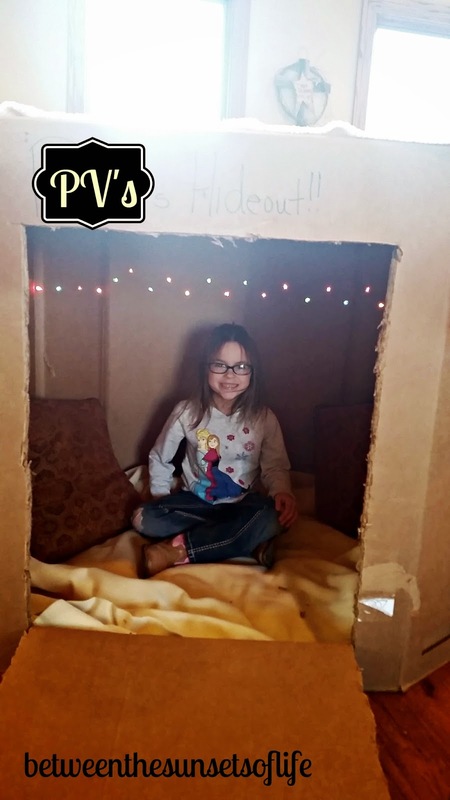 She has gotten her Dad to help her build things she has designed and our family room is now a cardboard party room! Campers, houses, and even jaguar's own swimming pools! So I decided I would go for a cardboard addition! I know, call me nuts, but the kids has a great time in them. When the grandkids come to visit they do too! I have a friend Joey that I'd like to give a big shout out to! 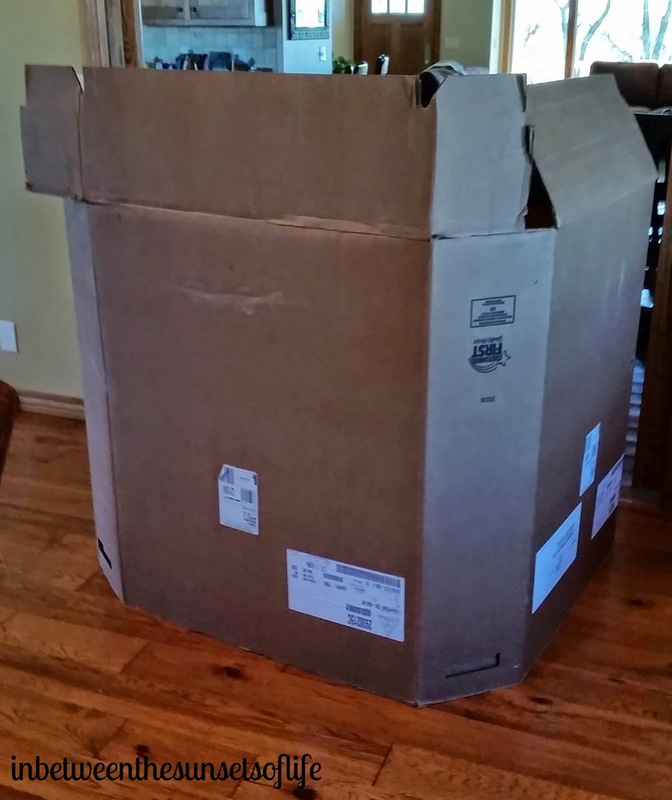 She saw on my Facebook page that I was wanting ideas and she offered to get me a HUGE and THICK box from her work! Let's just say, it is a VERY thick piece! This lovely piece of huge cardboard is like three panels thick! No joke! 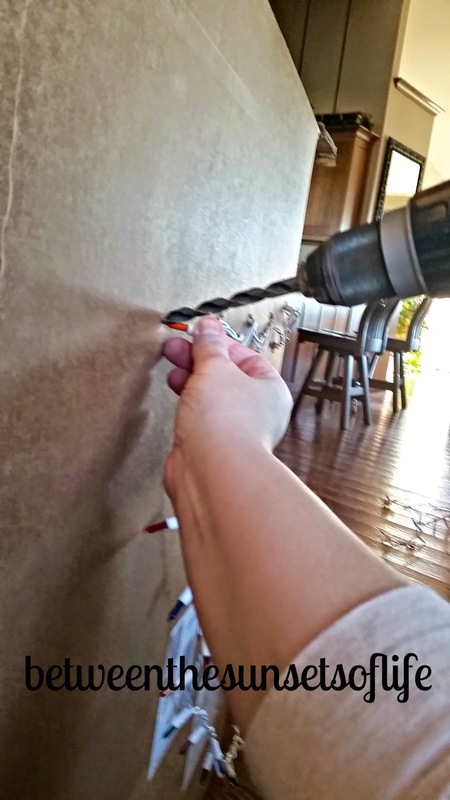 The drill and jigsaw were in town with my husband, so I resorted to using a kitchen knife. A CUTCO kitchen knife! It didn't break (thank goodness) and it ended up working well after a very long time! I knew I wanted to string some Christmas lights in it, so after the husband got home he drilled the holes while I inserted the lights! I decided after this that since I couldn't get it as fancy or as done as I wanted to by the time PV got off the bus we would decorate it together with Paint pens. I threw a blanket and pillows inside and one on top. This way when she wants to have more light, she can just throw her little roof blanket off & to da! Sunroof! When she got off the bus I told her I had a surprise and Dad led her in with her eyes closed , so I could video her reaction. IT WAS AWESOME FUN! She loves it and we both enjoyed decorating it together! I'm glad I waited to do it with her! So I was a child today and it was good to play with my six year old. It was a delight to see her authentic smile and her bright eyes from something so simple. I am grateful to Joey for providing me with the supplies, Milton for helping me finish it, and Kassidy for encouraging me to live like a child. 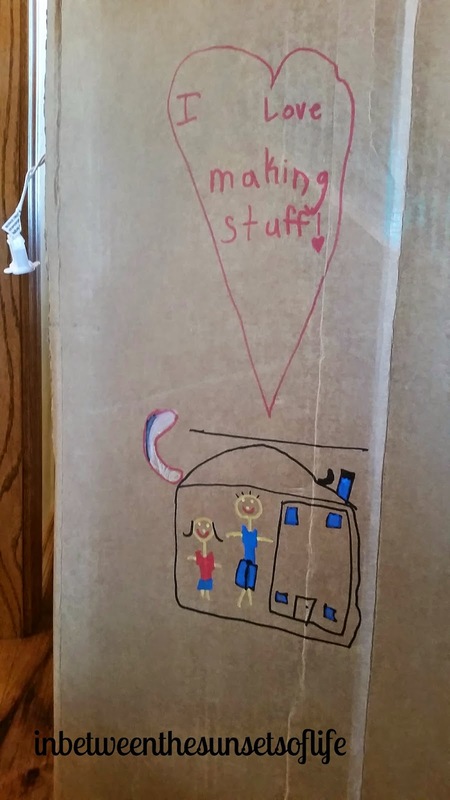 What's the simplest thing you've ever done as a child or with a child? Do tell my friends! My husband gave me a couple cookbooks for Christmas. I decided instead of just barely using them I would actually put them to good use! Here is one of them. I spent time in my Entertaining Kitchen last week preparing this bread for my family. 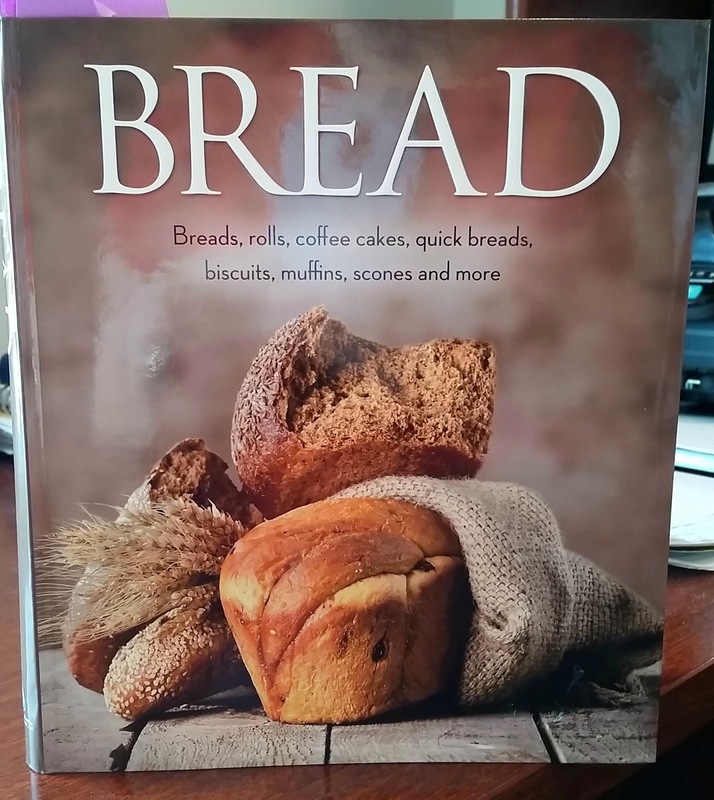 Although we don't normally eat this type of bread, I want to be sure to expand our horizons so to speak. 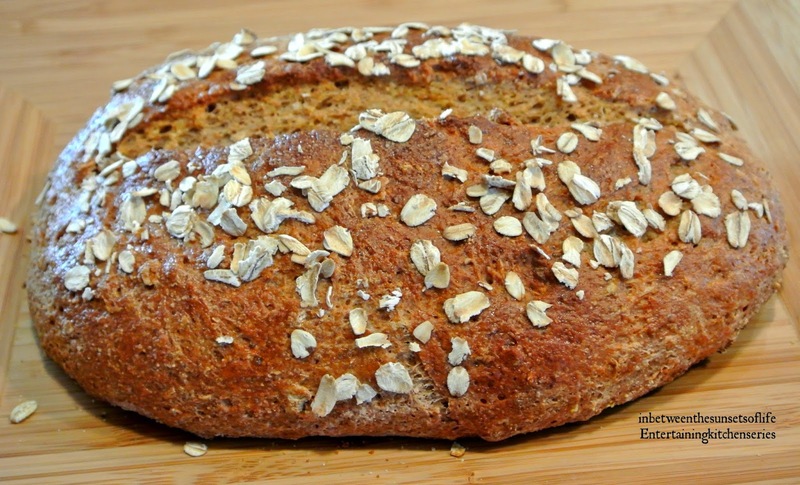 This recipe came from Page 12 of the Bread Cookbook by Publications International, Ltd.
1. Combine milk, honey, oil, and salt in small pan; heat over low heat to 115 degrees to 120 degrees. 2. Whisk whole wheat flour, all purpose flour, and yeast in large bowl of stand mixer. Add milk mixture; beat at medium speed with paddle attachment 3 minutes. Beat in 1/2 cup oats and 1/4 cup cornmeal at low speed. If dough is too wet, add additional flour, 1 teaspoon at a time until dough begins to come together. 3.Replace paddle attachment with dough hook, knead at low speed 5 minutes or until dough is smooth and elastic. 4 Shape dough into a ball, place in greased bowl, flip over so top does not dry out. Cover with cloth and let rise for about an hour or until dough is puffy and does not spring back when touched. 5. Sprinkle baking sheet lightly with cornmeal. Punch down dough, shape into 8 inch loaf. Place on baking sheet. Cover and let rise in warm place about 45 minutes or until almost double in size. Preheat oven to 375 degrees. 6. Cut shallow slash down center of loaf with sharp knife. Brush lightly with egg mixture; sprinkle with remaining 1 tablespoon oats. 7. Bake 30 minutes or until loaf sounds hollow when tapped and internal temperature reaches 200 degrees. Remove to wire rack to cook completely. Since my oven is not under my stovetop, I like to heat one of my ovens to 200 degrees. Then when I am ready to have the dough raise, I will shut it off, cover pan with damp large towel, and place in the oven. Leave the oven door slightly open. Works like a charm! If you try the recipe, please be sure to let me know what you think of it. We thought it was tasty! A different texture than we are used to, but still delish! 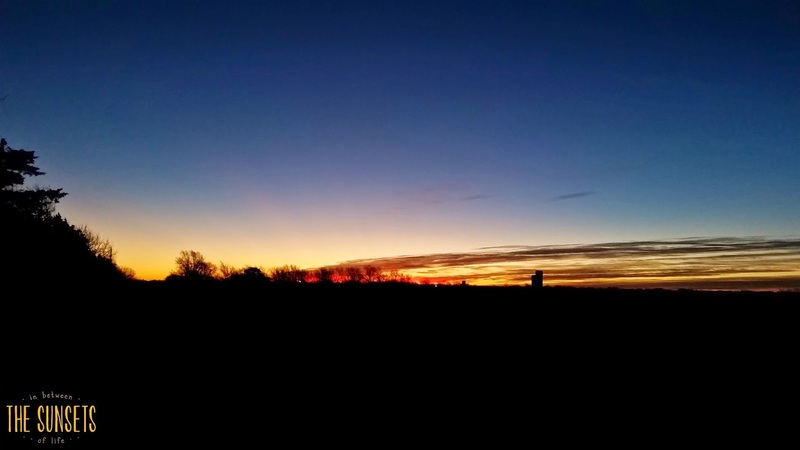 Life on the farm becomes a slower pace for us in the winter. 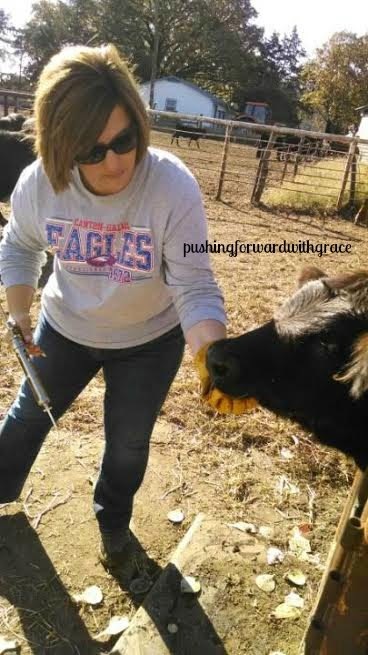 Since we only have feeder calves for livestock we are different from other ranchers/farmers. For example my friend Laurie over at Country Linked they have a different operation for livestock or Jennifer at Heim Dairy as well. Our main income is from our grain crops we raise, but during the winter we feed the calves to supplement income. And give my father in law and husband something to do, like that ever really runs out! NOT! The calves are usually delivered in October or November. We have a cattle buyer that my father in law has worked with for years. He goes to the sale and purchases for us and delivers by semi to our farm location. Usually it's in two or three different loads at various times. Once the calves have settled for a day we will work the them. This entails us giving them shots and branding them. To be honest I really enjoy helping with this part of the livestock operation. It brings back memories of my childhood days. My posts Fall Farm Happenings and Time to Sell show some of the livestock we have had and what occurs. Some people are against working cattle like we do, but my philosphy is this. If you don't like that type of meat or grain, don't buy it. Agree to disagree. The end of they year is a time when our farm really looks at what we have done in the past year and gets our things ready for the new year. Our farm year end is not December 31st, so it's not so much for us to get ready for tax time. It's more about reviewing what we bought, sold, and what is left. Also how we want to look at the following year. Although we review things throughout the year, one can take a deeper look due to the slower pace of life. 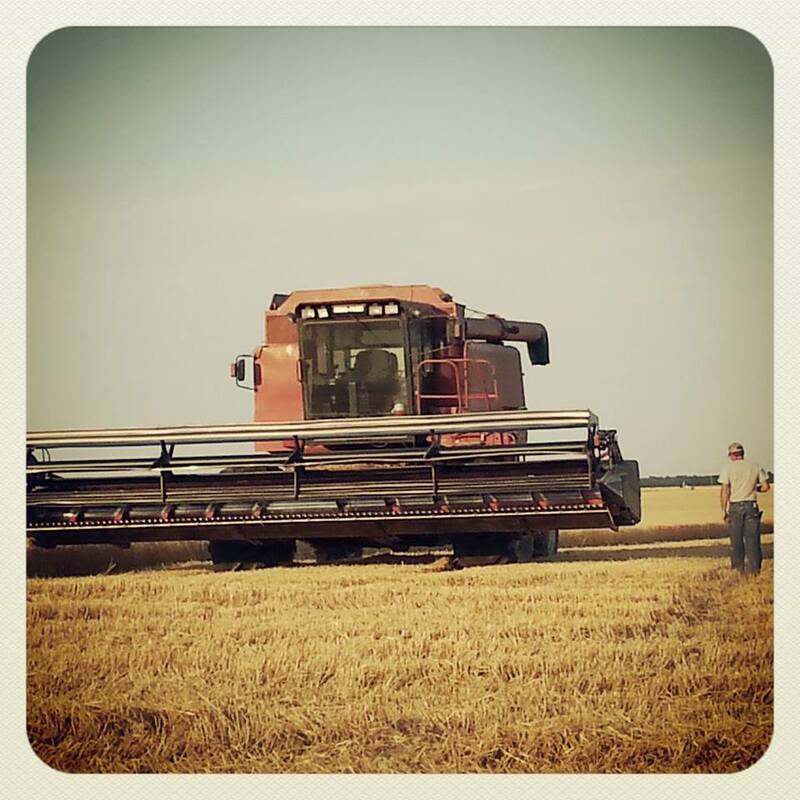 This year it was finally time for Milton and I to purchase a combine. This isn't something you take lightly as a used one can be as pricey as a home. We have been talking, thinking, researching, and praying on it for about two years. 2014 marked the time for us to make a purchase. I am excited about this purchase because I was a part of it and learned things. 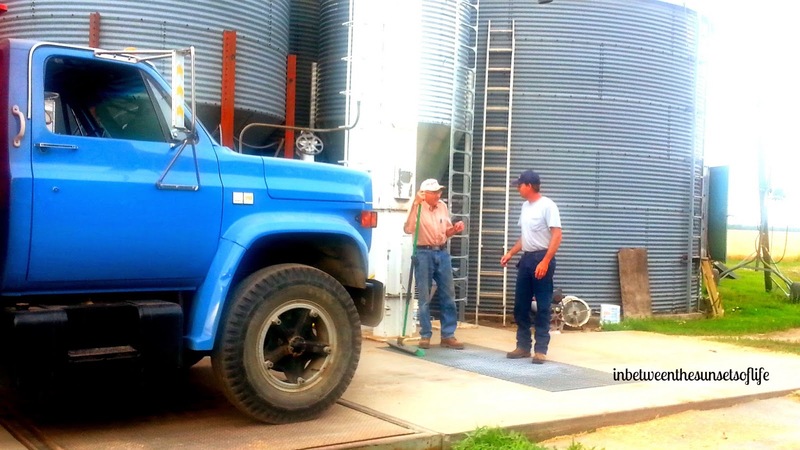 I was able to witness my husband's knowledge about farm machinery and taking our time gave us the opportunity to discuss it until we both agreed. I promise better pictures later! Our new to us combine isn't at the farm yet, but just like the cattle buyer, it comes from someone we trust. Someone they bought their last combine from. Building relationships is very important not only in farm life but in life in general. In this internet, world wide web, social media world it's good to just be able to shake hands, discuss face to face, and know that your gut is feeling good with the choice. 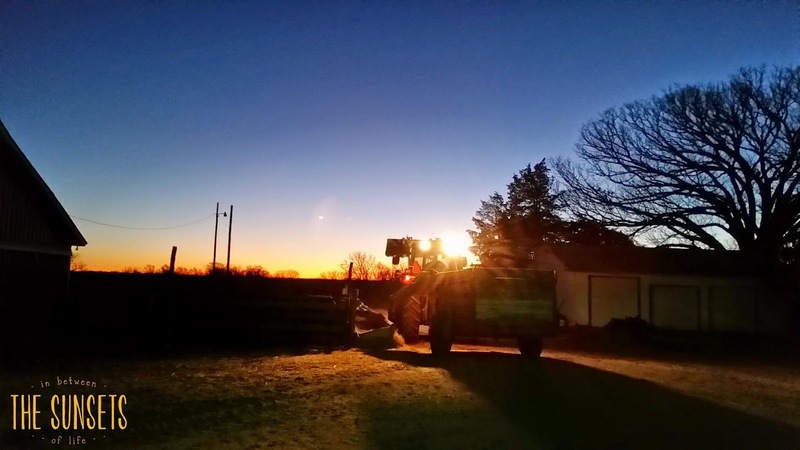 Our winter is spent with my husband waking early to feed the livestock and review our other farm equipment, do farm books, and search for a new combine header. Before we know it he will be planting, harvesting, and working long days. So we will relish our slower than normal days now, even if it's bitterly cold out! 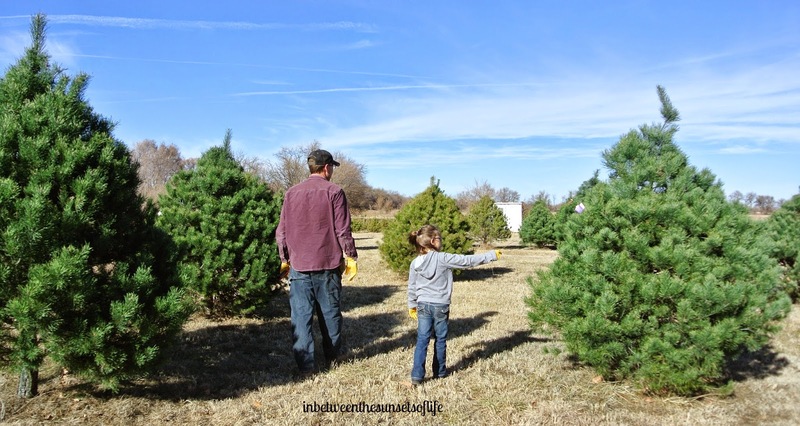 We made our trip to get our tree. I set a budget and kept to it, but then for the first time in forever I bought a real wreath! Our tree was alittle sparse but it was still fitting. It set perfectly in a corner of our large window! There was, for the first time that we were able to listen to our daughter read each night from the bible for our Advent calendar. It truly meant alot to us and it brought us closer together. We had our Family Gingerbread house decorating and if any of you follow us on Facebook, you know who won. The farmer won it by a landslide! But we will de-throne him next year! :) IT was one of the best times of the seasons with our kids and their families! 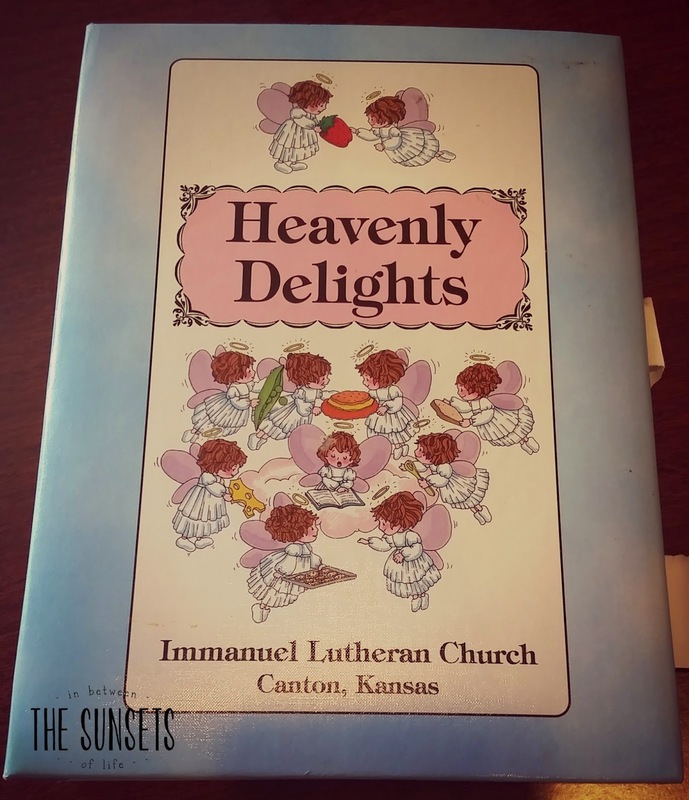 I was able to celebrate an evening with my LWML group and find out who my prayer partner had been during the 2014 year. It's a feeling of goodness when you know someone is diligently praying for you and your family. I also received a treasured gift. I was in shock! No use of this photo is allowed. We made goodies this year as well. Not the best thing to have in the house when you are trying to get healthy! We made almond bark pretzels and I like to call them haystacks. I have no idea the real name or maybe that is it. I don't know. Peanuts and chow mein noodles drenched in white almond bark. YUM! 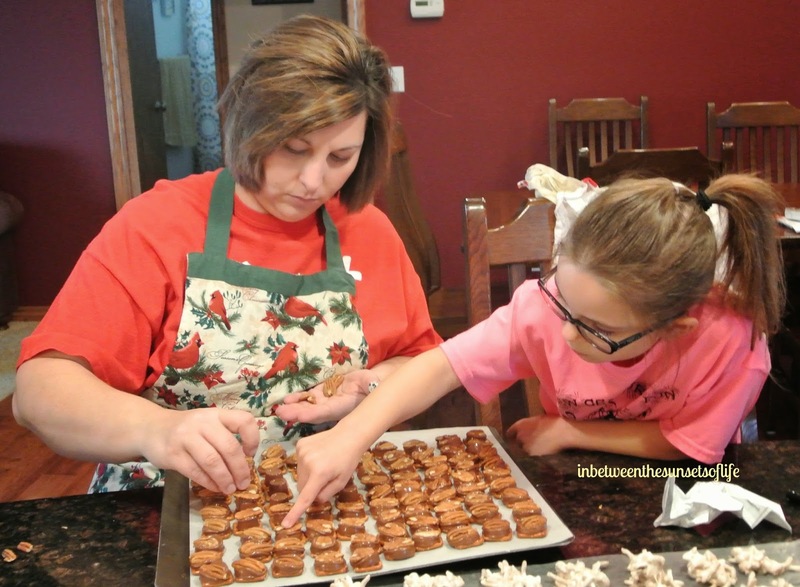 Pecan brittle was made by Milton, and those rolo/pecan yummies too! 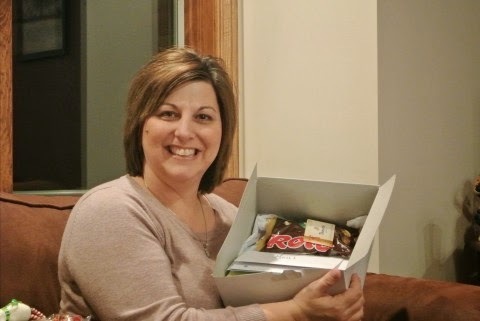 Last year I received some DELISH homemade caramels. from Christmas in the Country! So I tried them this year and gave them out. If you would like the recipe, check out my friend Jessy's blog. I plan to make them again for Valentine's day for my family members. Homemade is better than store bought anytime right? Another fabulous moment was when our daughter was proposed to at our family gathering! :) It was a delight, and we so appreciate being a part of the big moment! So 2015 will be filled with planning a September wedding! My side of the family enjoyed a meal together. 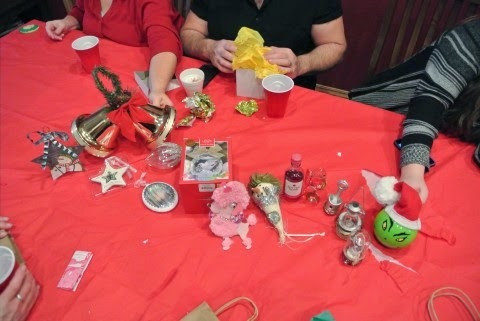 In our family the kids 18 and younger have a gift exchange with names chosen. The adults join the ornament game. It is so much fun! This year I threw in another game. 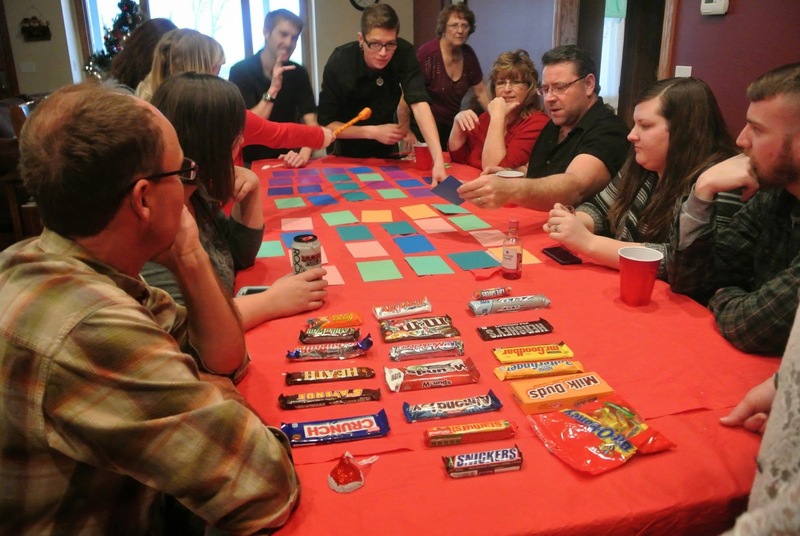 The Candy Bar game. I found it on good ol' Pinterest. I wasn't creative enough to come up with descriptions using my family members but it was still fun. And let me tell you, it wasn't easy searching for candy bars at the stores. In fact some of them I couldn't find. But we had enough! 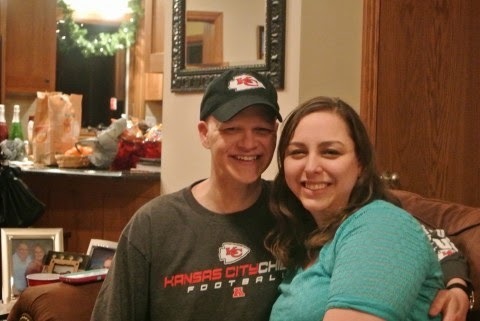 I wrote a special post about the gift that we made for Milton's parents. 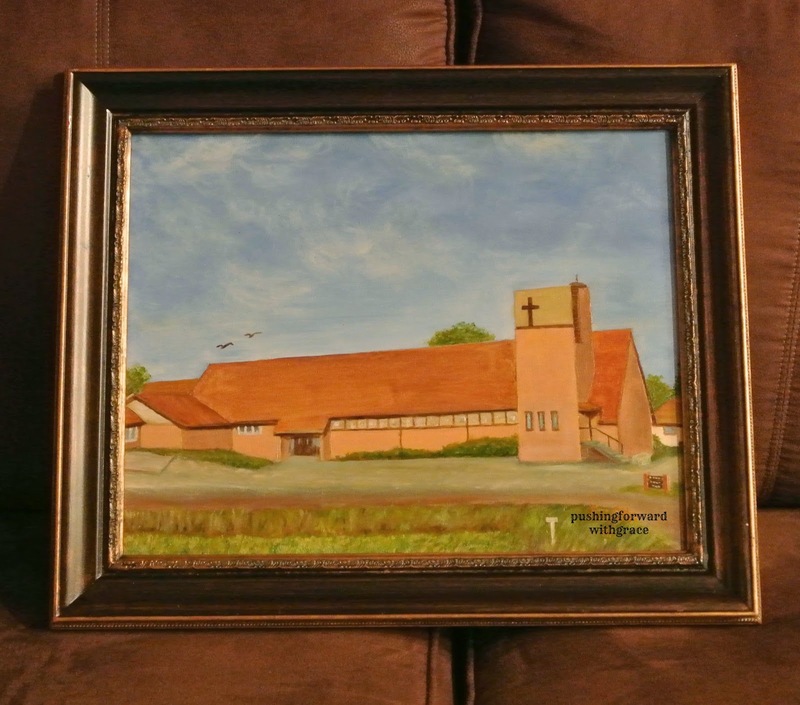 If you missed it be sure to check out Making Farm Beautiful!